This riding vacation was filmed for the Emmy-winning TV series, Equitrekking, so you can watch the guide, David Foot, ride with Equitrekking on PBS! Botswana is one of the best places in the world to ride horses and get up close to wildlife. If you are a fit, competent rider, there are a variety of awesome horse safaris in Botswana, and our team from Equitrekking has tried all of the ones you'll see featured on EquitrekkingTravel.com and our preferred travel agents can help match you with the best fit for you, your family or group of riders and non-riders. The vast, open Makgadikgadi Pans, with it's amazing zebra migrations and awesome star gazing opportunities, make it a great area for an African horse safari. For the African safari of a lifetime, pair the Makgadikgadi with the lush Okavango Delta. Explore the meandering shoreline of the remote and mysterious Makgadigadi Saltpans, one of the largest salt pans in the world, with David Foot, who has been leading horse safaris in Africa for over 17 years. The site of an ancient lake which has since dried up, the Makgadigadi Pans are the size of the European country of Switzerland. These moon-like landscapes are great for cantering and faster riding. There are many other attractions as well, including some of the best star gazing in Africa, meerkats and the San Bushmen, one of the oldest tribes in the world. There are two distinctly different seasons in the Makgadikgadi. The dry season, lasting from around April to October and the wet season, lasting from around November to April. When the rains arrive at the beginning of the wet season, the landscape is transformed. Water gathers on the saltpan. Algae bloom, crustaceans breed, and clouds of flamingo descend to feed on them. Then herds of zebra and wildebeest materialise, drawn by the lush grass, and for several months, the desert is teeming with game and predators. Guests visiting Camp Kalahari during the wet season can witness the last surviving migration of zebra and wildebeest in Southern Africa. Most people associate the migration with East Africa and don’t know about this, the second largest migration of African ungulates, with an estimated 30,000 animals, the majority being zebra, participating each year. 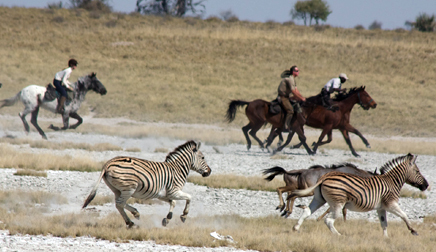 It is during the dry season that guests can experience the vast Makgadikgadi Pans on horseback or quad bikes. The guides at Camp Kalahari team up with a small group of Zu/’hoasi Bushmen to guide travelers on a morning’s walk, offering a window into the past. The Bushmen teach how they have survived in this harshest of environments, using their vast and ancient knowledge of plants, animal behavior and survival skills. Experience extraordinary landscapes; desert-adapted Kalahari wildlife from meerkats to brown hyenas; the history of Livingstone, Selous and other explorers; and travel with Zu/’Hoasi Bushmen. In the dry season ride fast out into the heart of the Pans and still arrive nowhere. In the wet season, ride with the last surviving migration of zebra and wildebeest in Southern Africa. High rainfall and high temperatures. Highs range from 35°C to 45°C. Lows around 18°C. Dry and warm, cool evenings and mornings. No rainfall. Cold nights and early mornings. Days are sunny and generally warm. Temperatures range from 15°C to 30°C. Nights can drop below freezing in some areas. Dry and warm. October can be extremely hot. Nov – Jan: Summer. High rainfall and high temperatures. Highs range from 35°C to 45°C. Lows around 18°C. Your guide, David Foot, has been leading horse safaris in Africa for over 17 years. He'll match you with a horse based on your skill level and personality and explain the history and culture of the region as you ride with him. Twenty horses - mainly Boerperd, Friesan crosses and Appaloosas. English or trail saddles, but the horses trained in English. The horses are trained for safari work so they are fit, schooled, sure footed and not afraid of the wildlife. Close by is the famous Chapman’s Baobab (Also known as the Seven Sisters) which is acknowledged to be the third largest tree in Africa, and was the campsite of early explorers like Livingstone and Selous when they pioneered the area.This gives you an opportunity to gain a fascinating insight into the history of the early explorers. Walk with the Bushmen and learn their ways of desert survival. The earliest modern inhabitants of southern Africa were the Bushman (San) and the Hottentots. They have lived an almost unchanged lifestyle in the country since the Middle Stone Age. For those who want to ride fast, ask us about quad bike adventures, where you can ride fast across the Pans. Wildlife Viewing and those Cute Meerkats! A safari to Camp Kalahari is also a complete desert experience focusing on species unique to the area such as aardvark, gemsbuck and springbuck. Guests may spot the rare and elusive brown hyaena and are able to walk through the Kalahari with a gang of habituated but wild meerkats! As the sun rises, these pixie-faced creatures emerge from their burrows and join you, sunning themselves with paws behind their backs, completely indifferent to your presence. A baby might sit on someone's toe or a sentinel hop onto your head! As they all scurry off to forage, you follow. The meerkats dig up scorpions and pounce on beetles while your Guide maintains a running commentary on their social habits and survival strategies. Extensions to the horse safari can be made by vehicle to Nxai Pan National Park, the Central Kalahari Game Reserve and the Okavango Delta. These extensions can be to lodges or on a mobile safari by vehicle guided by David. David also runs four safaris per year combining the Makgadikgadi Ride with three nights on the Selinda Canoe Trail. Camp Kalahari is a return to the traditional safari style of the old explorers, and is the best way to experience the Makgadikgadi. It is the ideal camp for those who want fun, comfort, style and adventure. Camp Kalahari accepts children of all ages and makes for a fantastic family safari destination. Camp Kalahari offers large ‘A’ framed tents with en-suite bathrooms. The fly camp is more simple, with large dome tents and bucket showers. Camp Kalahari’s chef is talented, noted for his tasty soups and particularly for his "Pilli-Pilli Ho-Ho," a lethal concoction of chillies marinated in sherry and gin. Smeared over one's breakfast eggs, it's just the thing to sharpen sleepdulled wits in preparation for whatever adventures await! Vegetarian options available. Advanced riders and their non-riding partners with a sense of adventure. Botswana is an awesome place to go on safari and the Makgadikgadi and Camp Kalahari offer amazing opportunities to ride with game during the migration period, as well as wonderful natural history, star gazing and the unique chance to interact with meerkats. Ride with the last surviving migration of zebra and wildebeest in Southern Africa. Explore the meandering palm tree shoreline of the mysterious Makgadigadi Saltpans. Experience extraordinary landscapes and desert-adapted Kalahari wildlife from meerkats to brown hyenas. This riding safari is based from Camp Kalahari on the edge of the Makgadikgadi Pans and is only suitable for intermediate to experienced riders. There are two five night set departure dates every month for a maximum of 8 participants. Three nights are spent at the camp and two nights in a fly camp. The itinerary changes slightly between the wet and the dry season. As well the set departures other dates are available on request for group reservations. Consider combining a Makgadikgadi safari with the Okavango Delta for the trip of a lifetime! A single supplement must be paid if a participant is unwilling to share accommodation. Fully inclusive except for items of a personal nature and local gratuities. A single supplement must be paid if a participant is unwilling to share accommodation. Luggage for local flights is limited to 43 lbs (20kg) per person in soft bags including hand luggage, riding kit and camera equipment. This is strictly enforced by all charter companies for safety reasons. A thatched central library, living and dining area featuring an eclectic mix of original African furniture and textiles paired with traditional campaign style pieces and colonial antiques provide the perfect area in which to relax and enjoy the serenity of this enchanting area. Cool off in the swimming pool or enjoy a siesta in the thatched pavilion! All Guest tents have en-suite covered bathrooms, hot and old running water and flush loos along with four poster beds, crunchy cotton sheets, rich textiles, Moroccan kilims and hot water bottles in winter. Head off after tea in the beautiful afternoon light, for an introductory ride primarily to match horse and rider but also your first opportunity to experience the beauty of this magical area. Return to the camp for sundowners followed by dinner and to kraal the horses close by. Stranded on the ancient lakebed, these sand dunes covered in palm trees are one of the most beautiful and fascinating areas of the Botswana wilderness. At the height of the migration season, the islands and adjoining grasslands are awash with zebra, wildebeest, hartebeest and ostrich and of course the attendant predators! The white encrusted pans between the islands provides excellent going for the horses, but if there has been a lot of rain then many of these areas will be full of water attracting several species of migratory water birds. Return to the camp for lunch and rest through the heat of the day in the welcome shade of the camel thorn trees or cool off in the camp swimming pool. The journey takes us away from the edge of the Pans and through the mopane and acacia woodlands interspersed with short grasslands allowing for lovely long, relaxed canters. Whilst the area is rich in birds of prey, bustards, korhaans and numerous other unusual dry woodland bird species; there is also a chance that we will sight kudu and the odd elephant bull. By lunchtime we reach the famous Green’s Baobab proudly positioned alongside the well-travelled Missionary Road, traversed by David Livingstone on his journeys northwards. The magnificent trunk of this ancient tree is scarred with the initials of early travellers dating back some 150 years thus providing a living testimony to the rich history of this area. Break for lunch at the adjacent Gutsa Pan under a stand of palm trees where we may find Stone Age artefacts and the hunting blinds used over millennium by the Bushmen. From a great distance the famous Chapman’s Baobab appears on the horizon. Also known as the Seven Sisters, it is acknowledged to be one of the largest trees in Africa, measuring 25metres around its girth, and was the campsite of early explorers like Livingstone and Selous when they pioneered the area. The Zu/’hoasi lead a semi-traditional lifestyle, and share their traditional hunting and food-gathering skills as well as how they make jewellery and hunting equipment, it is a glimpse into their traditional way of life, but by no means an attempt to keep them frozen in time. Head off after tea in the beautiful afternoon light, for an introductory ride – primarily to match horse and rider and to provide the opportunity for Guests to experience the beauty of this magical area. Return to the camp for sundowners followed by dinner and to kraal the horses close by, before the lions of the Kalahari commence their nightly prowling. Up with the dawn, a light breakfast is followed by a long morning ride through the “land of a thousand islands”. Stranded on the ancient lakebed, these sand dunes covered in palm trees are one of the most beautiful and fascinating areas of the Botswana wilderness. At the height of the migration season, the islands and adjoining grasslands are awash with zebra, wildebeest, hartebeest and ostrich and of course the attendant predators! The white encrusted pans between the islands provides excellent going for the horses. Return to the camp for lunch and rest through the heat of the day in the welcome shade of the camel thorn trees or cool off in the camp swimming pool. Today is a long ride eastwards to Xau Xai Fly Camp, so an early start is imperative. Be sure to pack a few essentials for the next two days of adventure. The journey takes us away from the edge of the Pans and through the mopane and acacia woodlands interspersed with short grasslands allowing for lovely long canters. Whilst the area is rich in birds of prey, bustards, korhaans and numerous other unusual dry woodland bird species; there is also a chance that we will sight kudu and the odd elephant bull. Siesta through the midday heat and after tea, continue the journey on to Xau Xai Fly Camp. The camp will be made up of comfortable dome tents, a central mess tent, loos and bucket showers. With our horses tethered we will proceed on foot in to the midst of the group. Due to an ongoing habituation programme by Uncharted Africa Safari co. it’s possible for us to get up close and personal with these captivating creatures. Remember, they are not tame just used to our non-threatening presence. Return to Xau Xai for lunch and a refreshing shower. Set off in the late afternoon for one of the greatest adventures imaginable a ride straight out into the middle of the ancient lakebed! Eventually all that can be seen is the vast flatness stretching in every direction. Watch the sun set and the stars rise. This is one of the only places in the world where the silence is so complete you can hear the blood circulating through your ears. There is not one visual landmark to be seen and one swiftly loses one’s sense of perspective - 16,000 square kilometres of baking soda void, are inhabited only by you and a few gazillion invisible brine shrimp! And it is here that we’ll make camp. Sleeping on bedrolls under the silence of a star studded sky! Wake up on the moon! As the dawn greets this extraordinary landscape and the last of the stars disappear, head homewards directly across the Pans to Camp Kalahari, we may be lucky enough to see the unusual sight of ostrich deep in the Pans and then from a great distance the famous Chapman’s Baobab. Also known as the Seven Sisters, and acknowledged to be one of the largest trees in Africa, measuring 25metres around its girth, this great baobab was also the campsite of early explorers like Livingstone and Selous when they pioneered the area. This is a brand new horse riding safari, based from comfortable Camp Kalahari. Our Equitrekking team has personally tried this trip and filmed it for a new episode of Equitrekking. This trip had some of the most amazing star gazing we've ever seen and we were able to gallop with a herd of zebra! Stay tuned, as you'll be able to watch this on PBS and read more about the adventures in Darley's Blog and Darley's column in Practical Horseman magazine. Thanks for yet another fantastic trip. It was great to be back with you doing the guiding on your horses - it made us realise how much we have missed it. Your new safari in the Pans is a real winner - the combination of the wildlife, guiding, horses and sheer beauty of the landscape we rode through was mesmeric. It is a wonderful unique place and I really enjoyed seeing the contrast to the dry season after our trip to Jack's Camp in 2004. It is wonderful for us to hear our guests confirm what we believe! As you already know I am absolutely loving riding out in the Pans and did not think it could get any better but on the last safari (mid February) it could not have been more perfect. Rain had been scarce for the previous two weeks so many of the flooded pans had dried up allowing for superb riding. But some of the Pans still held water and around these it was like riding through Eden (I imagine!). The centre of the pans were pink with flamingoes and these were surrounded by the endless herds of zebra and wildebeest with some walking in single file one way through the Pan and others walking through single file in the other direction. And for the birding enthusiasts huge flocks of ruffs and sandpipers and more black winged stilts than I have ever seen in one place. Magical! The only downside was that none of us had a camera good enough to capture that image! But there are some wildlife images that stay with you for ever and that will be one of them. As will be the moment a mummy meerkat carried one of her young from one burrow to another climbing over all our legs in the process! A delightful introduction to Botswana's formidable female detective, evoking the cultures, customs and texture of Africa. An invaluable encyclopedic guide to Africa's mammals by a noted scientist. Written with the typical safari-goer in mind, this perennial bestseller includes black-and-white drawings, an overview of each group and in-depth information. English and Trail Saddles. English trained horses. 12 years and over for riding. Competent riders only. Year-Round, depending on your preference.